I’d like to win this book because it would be a great resource and early Christmas gift for my department. In the last year, we’ve implemented VDI running on VMware View, and we’ve started to experiment with VMware ThinApp in order to thin out our VDI master images. The information in that book would be helpful for troubleshooting the odd issues we’ve encountered when trying to ThinApp uncommon line of business applications that won’t show up on VMware’s website. With server virtualisation becoming the norm in the industry, the implementation of app virtualisation is quickly growing. I would like to keep ahead or on par with the current trends and this book would definitely give me the required edge. I’d preffer the kindle edition, who needs paper book in a virtualized world ? As an enterprising 24 year old, trying to change the traditinal IT landscape in north american organizations, I believe knowledge gives you the power to lead. After having successfully virtualized hardware with VMware technologies in production environments. 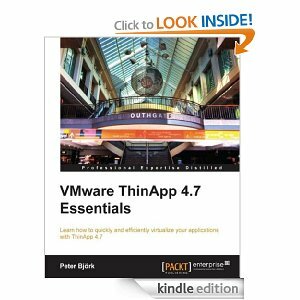 Where else to begin learning application virtualization other than “VMware ThinApp 4.7 Essentials”. I like to win this book because I want to improve my skills. I already have virtualized some applications using ThinApp, but want to know more about tips, troubleshooting and best practices! Plain and simple: I would like to win this book because I know nothing about ThinApp! Help me learn how to fish and i’ll feed a whole village, I promise! At my employer we’re looking to migrate to a new OS.. Will it be fully virtual? What about the 100+ apps, most of them Win32? Do we virtualize them too? Using what? AppV (i know, it’s cursing in the church [dutch translation]) or ThinApp? We’re already using VMware View, but some real cases could help us convince management to choose ThinApp! On the other hand, M$ is pushing us to choose AppV, so Luc, what do i have to choose? I was already thinking of buying this book. However, if there’s a chance to win it, it’s even better. I am trying to make a business case for using ThinApps in my company, and having this book would be a big help in that effort. This year we moved to a 99% VMware View linked clones environment with all applications installed within the master image. Now we’re at the point to take things a step further and virtualize our apllications. Packaging simple applictions is relatively easy, but how about the more complex ones like Office 2010, Autcad Map 3d and ArcGis Desktop? This not so easy as it looks. This book could give me insight in the more complex features of ThinApp and hopefully helps us to eleminate the need of installing these complex applications in our master image. I’m involved in a project to pilot VMware View and ThinApp in our environment, and would like to see as much useful information as possible about virtualizing our various applications. We are using ThinApp in our environment and I would like to know what’s going on inside ThinApp to better understand the tool and to better support our thinapp’ed application. We are planning to do even more ThinApp project in 2013. I’m planning a new desktop roll out soon which will finalily retire Windows XP. I’d like to learn more about VDI and how “ThinApp’ing” application can add value to the solution. Thinapp was key to helping my company do it’s biggest in place upgrades in 2011. After also meeting Peter this year having his book would greatly help with my understanding of Thinapp to use fully in 2013.